One of the goals of the Farmington Historical Society is to not only preserve and catalog items we receive, but to link items of similar nature or that have shared histories with one another. 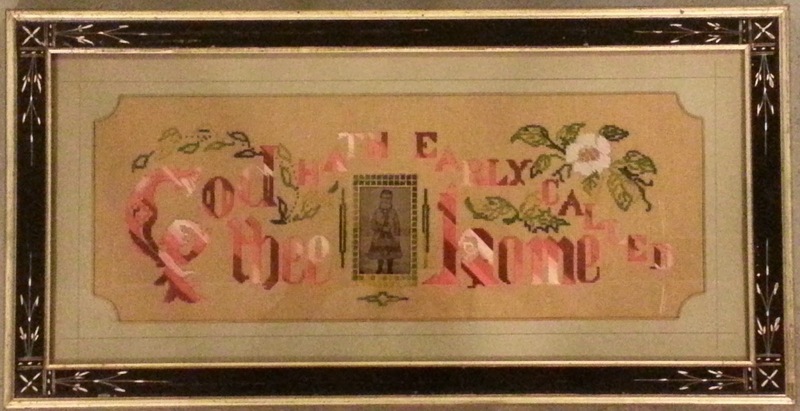 The sampler with picture above has been in the collection for some time. It did not have any related information stored with it, but recently that has changed. 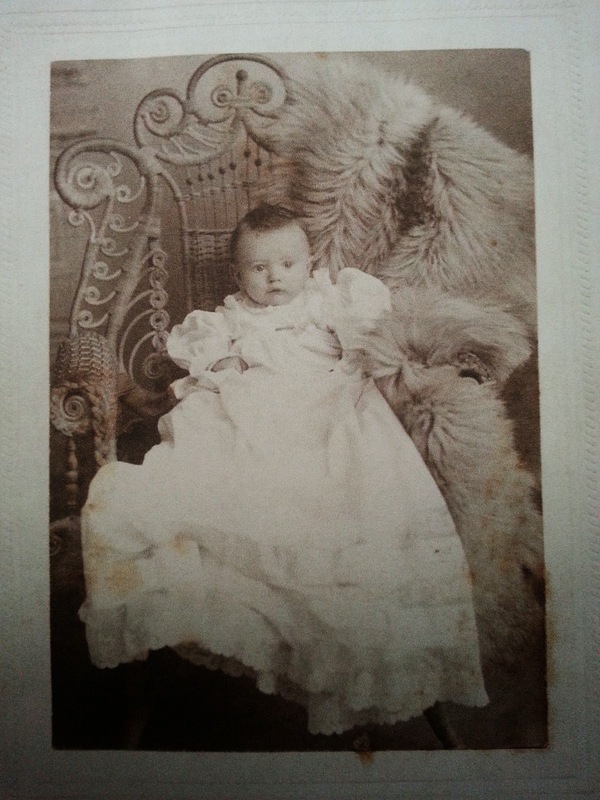 Richard Tucker contacted us about donating a christening gown belonging to his father. 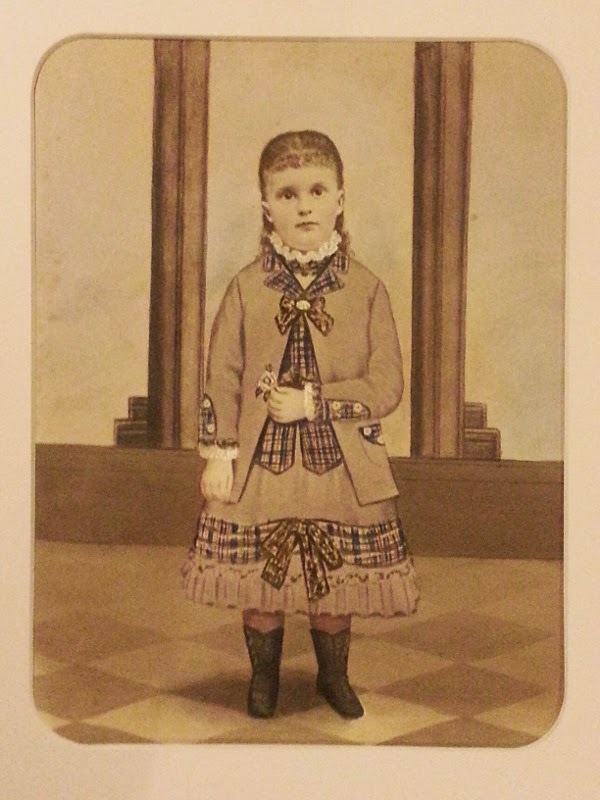 He was able to provide his father's family information and knew who the young girl in the photo above was. She was Elverna Gilman and was Mr. Tucker's great aunt. He was also able to provide us with copies of photos of some of his family and detail the relations in the following statement. 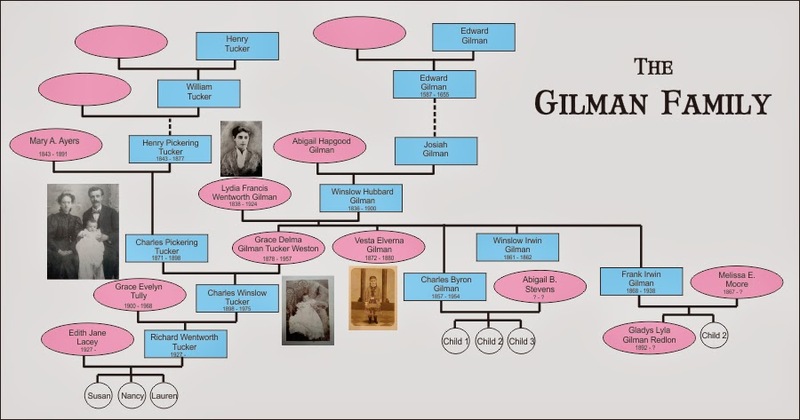 "Grace Delma Gilman (Elverna's younger sister and my grandmother) married Charles Pickering Tucker (my grandfather) in Farmington in June 1896. Their only child Charles Winslow Tucker (my father) was born February 1898 in Boston. Sadly, his father died of tuberculosis in November that same year. 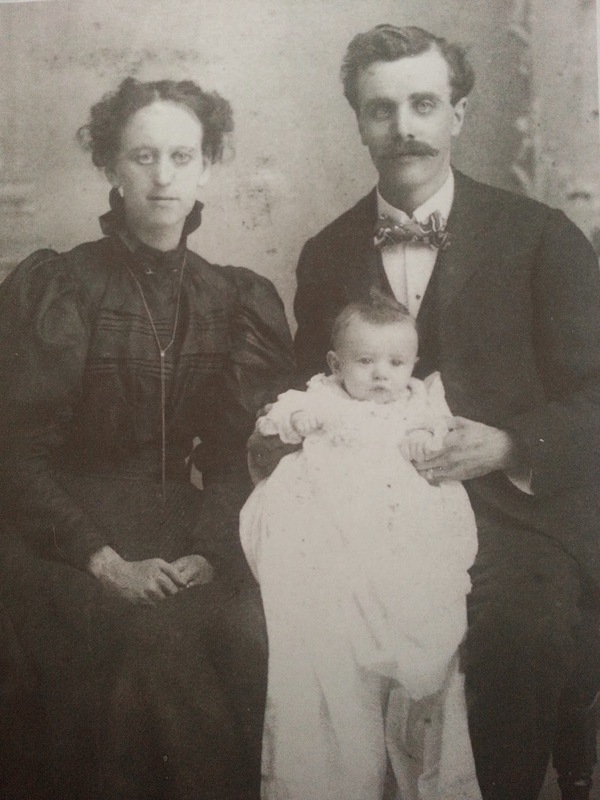 Shortly before his death Grace, Charles P. and their new son dressed in a fancy christening gown were photographed in Farmington by a local photographer, A. W. Shackton. I have photos of the gown by itself, my father in the gown propped up in an elaborate wicker chair and another of mother, father and son together. 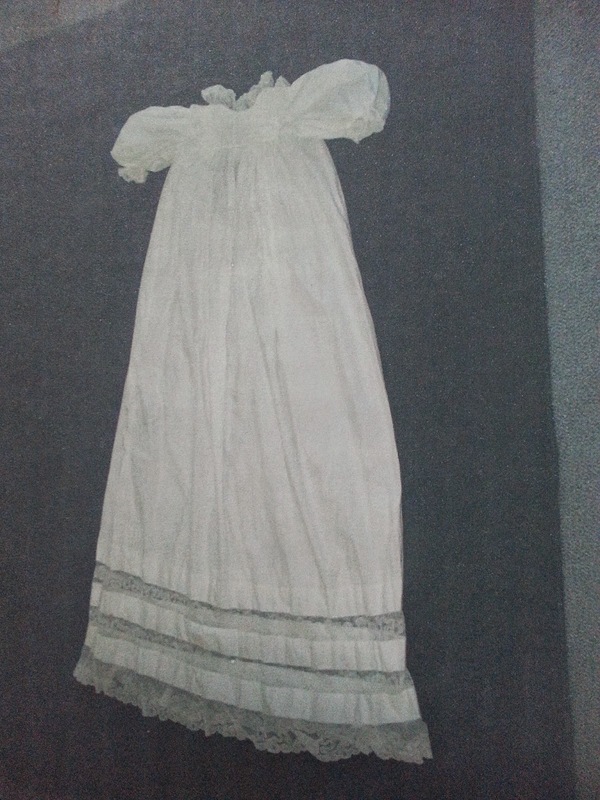 The gown has been kept over the past 116 years in excellent condition. I did some research on Mr. Shackton and found that the chair was one of his studio props and appeared in other photos I found on the internet. My thought was that the gown, the photos and the back story might find a home in Farmington." We were delighted to have this this information and he was also able to give us more information on his family line and documentation outlining the paternal side of his family. You can read some of his summation below. "My parents (Charles W. Tucker and Grace E. Tully) had two children, me and my younger sister Phyllis (b 11 June 1930.) Rather than provide all the details of our family history I am mailing under separate cover pedigrees sheets for me and my paternal side of the family. Grace Delma Gilman, Charles Pickering Tucker, and Charles Winslow Tucker in Farmington in June 1896. These are for the Tucker, Gilman and Wentworth branches of our tree which track them back to their arrival in America. My Tucker ancestor was born on the Isle of Shoals about 1622. The Gilmans hit the beach in Hingham, MA about 1650 and William, the first American Wentworth, arrived in MA about 1633 and was one of the folks who established Exeter in 1636. The cover sheet is an overview of my own family. You'll see that my lovely wife and I were married in Dec 1950 and produced three daughters, "all above average." In fact, they are. Susan graduated first in her class at Smith College and earned her PhD in Theoretical Mathematics at the University of Michigan. Her husband earned the same doctorate from the same university. Their son Stephen graduated from Reed College, Portland, OR; their daughter Lisa will graduate from Connecticut College next May. Our middle daughter Alison graduated with honors from Brown University, is married and living in California. Lauren, our youngest, graduated with honors from CT College and is married to a fellow grad who is now the number two man in the Maine State Dept.of Marine Resources. Son Ben went to Clarkson College and is now a propulsion engineer who works on nuclear subs in Groton, CT. Their daughter Amanda graduated from Tufts and is a techie and computer whiz in the Raleigh Triangle Research Center." These accounts and documentation now accompany the sampler and photo we had, as well as the christening gown. We are very grateful to Mr. Richard Tucker for his donation and for the information that helped to link these two items together.